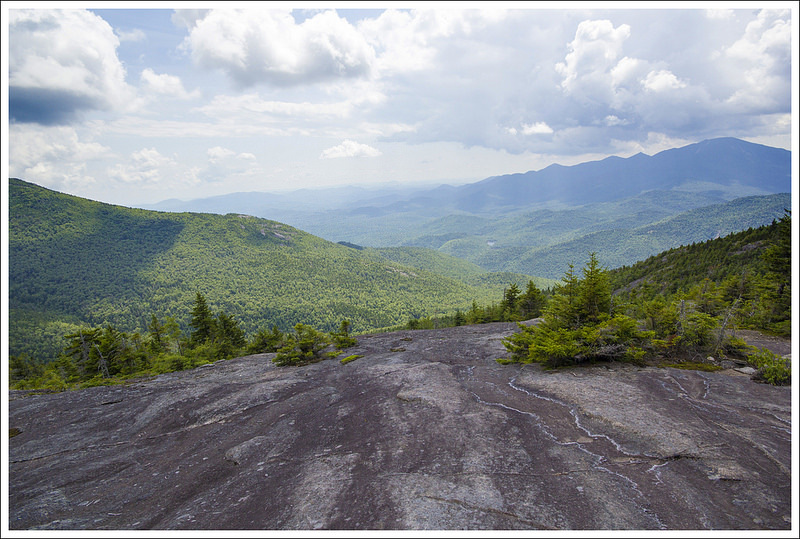 Giant Mountain is New York’s 12th tallest peak and the hike to the top is no joke! With about 3,400 feet of elevation gain in just 3.4 miles, lots of slick granite and tangled roots to negotiate, and several short rock scrambles, this is not a beginner’s hike. The views at the top and along the descent make the effort worthwhile, though. The hike winds down with a visit to a lovely glacial pond called the Giant Washbowl. Crowd gathered on the summit of Giant Mountain. Most of the people were part of one very oversized hiking group. Below: Trailhead information; There was fog catching the sunlight early in our hike; The steady climb begins early on the route. 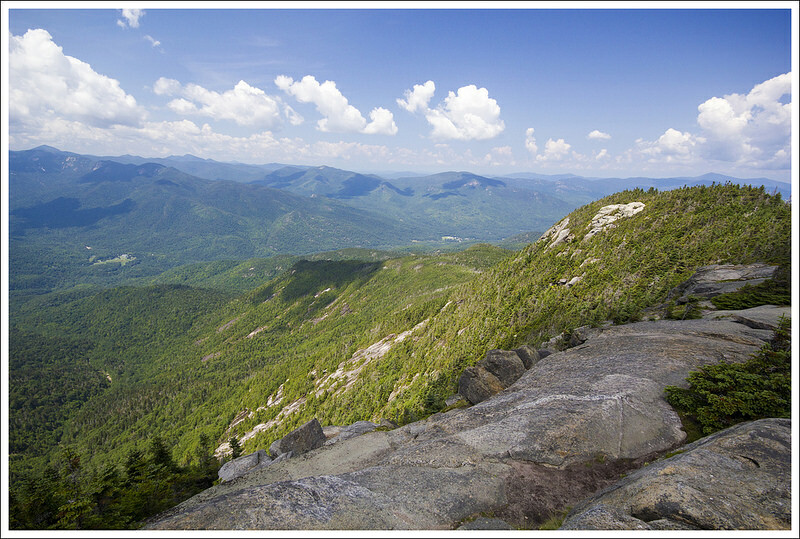 Giant Mountain is one of the Adirondack High Peaks, a collective name given to the 46 mountains that rise above 4000 feet. A survey later showed that four of these peaks are actually slightly below 4000 feet (and one other should have been included), however the ADK is keeping all of the original 46 peaks in this club. 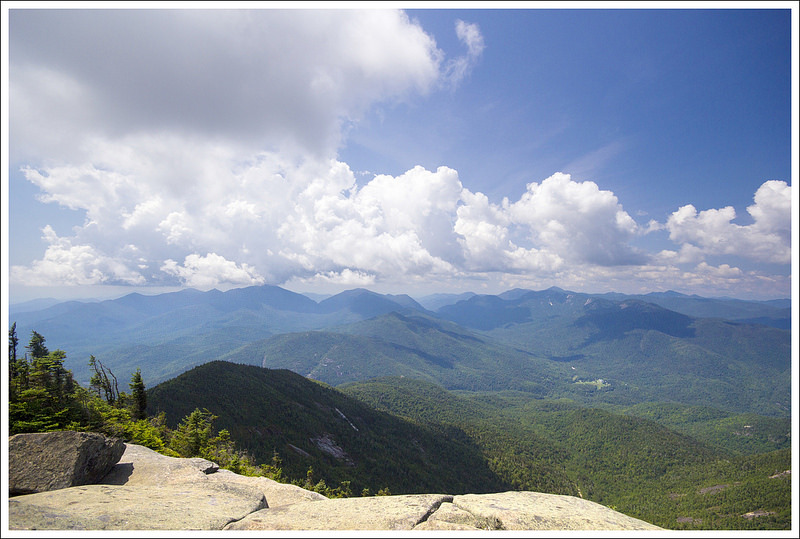 Giant Mountain stands as the 12th highest mountain in New York at 4,627 feet. 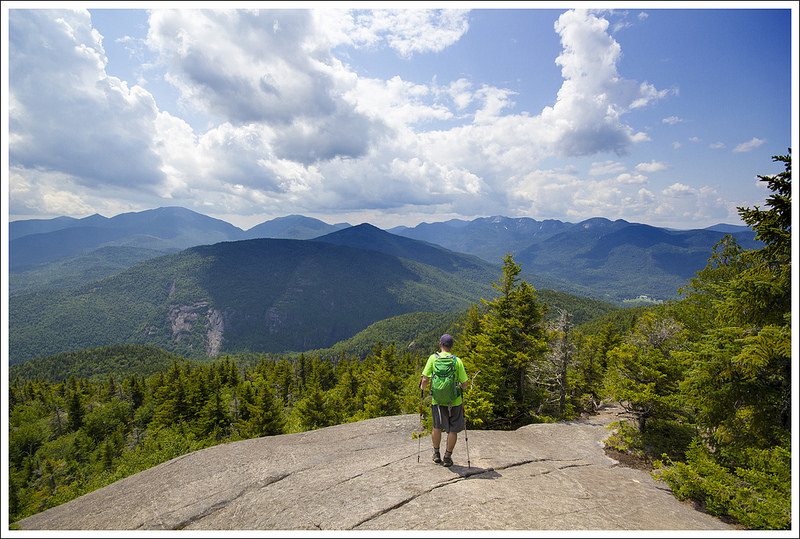 One thing we quickly discovered on our trip to this area is that there are lots of people trying to peakbag all 46 peaks – kind of a rite of passage for serious NY hikers. So, you will likely find fellow hikers on the trail. 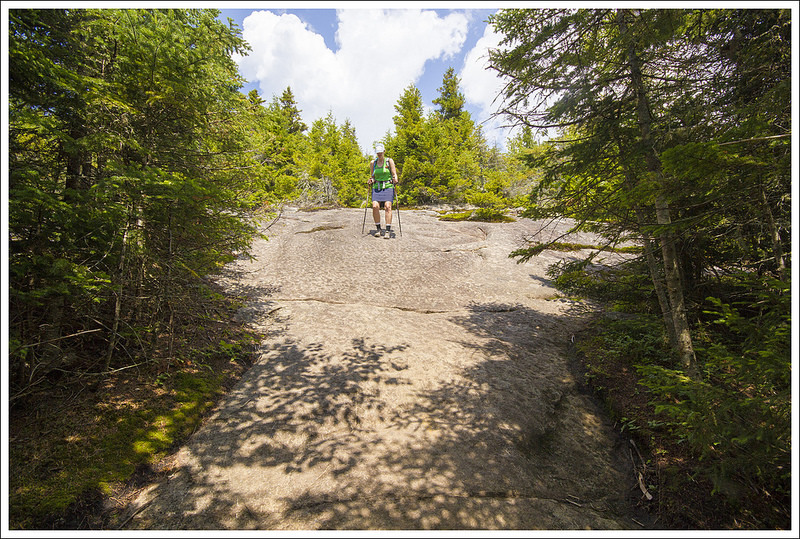 Giant also has several different ways to approach the summit, but this path would be the most popular, mostly because of the length and the access to see the Giant Washbowl and Nubble. 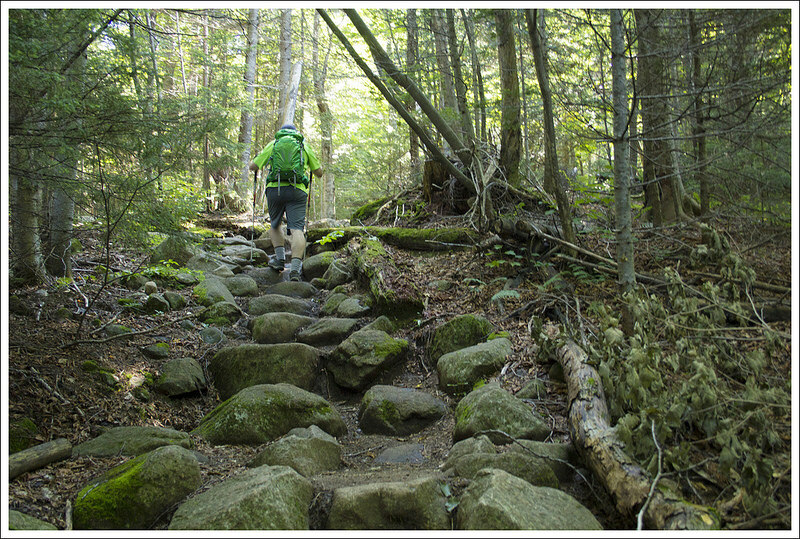 Some peakbaggers will approach this hike from another trail to the east to bag Rocky Peak Ridge, #20 on the Adirondack High Peak list. We found the parking lot without much trouble and began our hike on the Roaring Brook Trail. Within the first couple of tenths of a mile, the trail branches off to the left (the trail to the right leads to the base of Roaring Brook Falls) up a steady incline. The trail starts off with a lot of roots, but these are soon replaced with lots of large rocks to navigate. 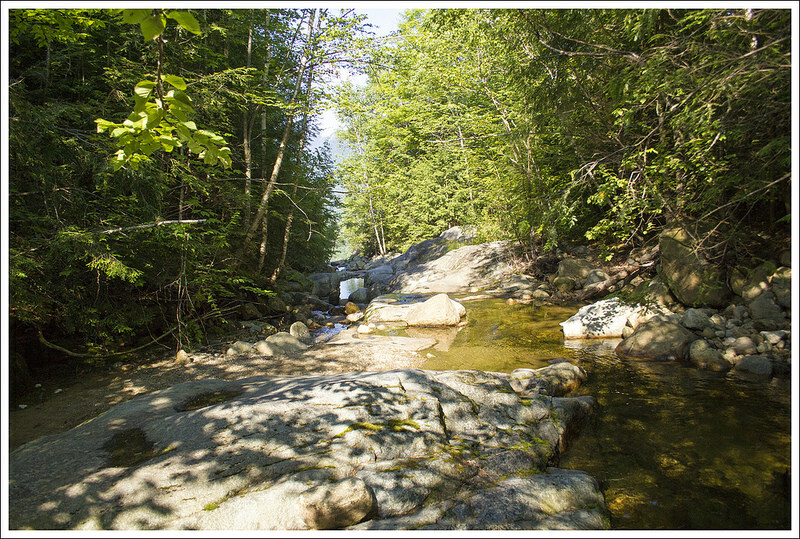 At about .5 miles, you reach a side trail while leads to a nice large campsite and the top of Roaring Brook Falls. Be very careful if you check out the stream at the top, since people have fallen over the falls and died. Backtrack your steps and rejoin the trail to continue the uphill climb. At 1.2 miles, you reach a junction that leads to the Giant Washbowl and Nubble (your return trip on this loop). 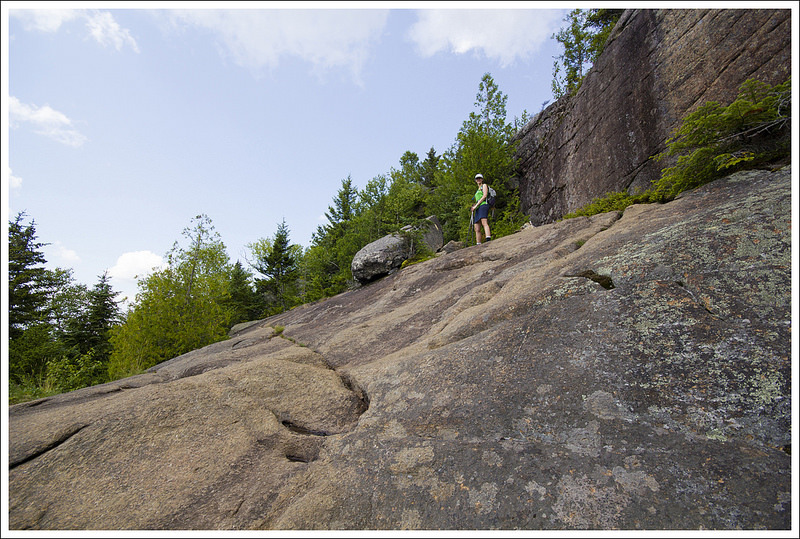 The terrain ascending Giant Mountain is varied with rock scrambles, smooth granite, cobbles, roots, stream crossings and more! 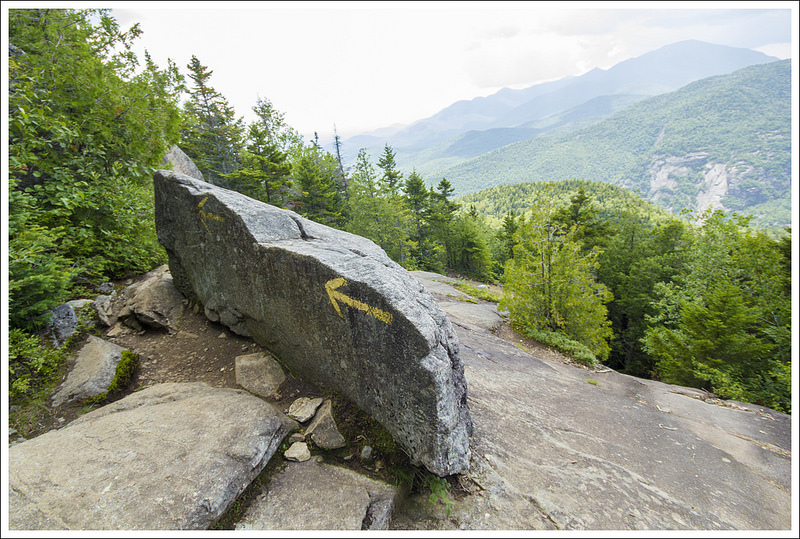 Below: The top of Roaring Brook Falls; A stream crossing; Trail Junctions were well marked. 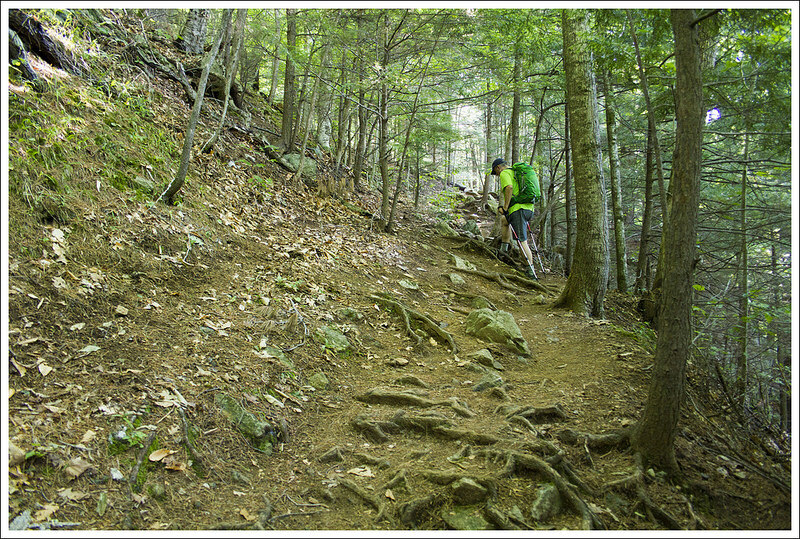 Continue uphill on the Roaring Brook Trail. Keep an eye on where you place your feet as you have to navigate along rocky steps through most of the rest of the hike. At 2.9 miles, you reach another junction. Turn left to head to the summit of Giant. This part of the trail had some extremely slick granite slabs to walk up. We had just had rain a couple of days ago, so some of these giant slabs were very tricky to climb. 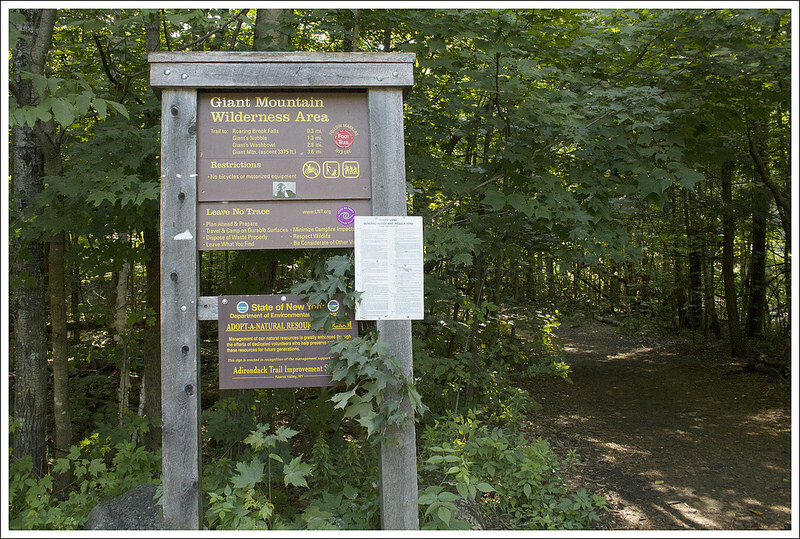 Eventually, you will reach the summit at 3.6 miles. Views at the top are truly breathtaking. On our descent, we returned back the way we hiked up. Christine was worried about the descent over the slick granite, but we took our time and even scooted down some surfaces on our butts to be extra safe. 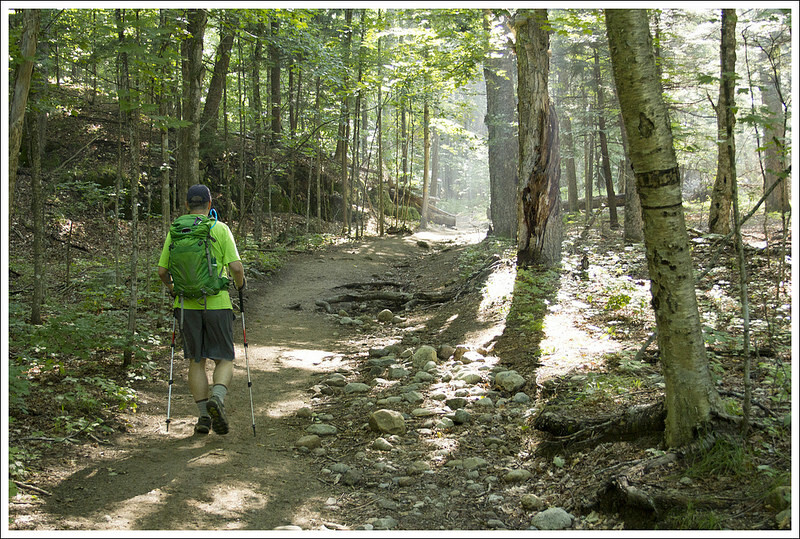 At 4.4 miles, we reached the junction of the Ridge Trail (also known as the Zander Scott trail) and Roaring Brook Trail. Instead of taking the Roaring Brook Trail back the way we came, we decided we wanted to see the Giant Washbowl. The descent was steep this way down, but there weren’t as many slick granite rocks – the area is more exposed and the sun dries the rock off more quickly. The way back on this trail gave us more incredible panoramic views, so we instantly knew we made the right choice. I would recommend to descend on this trail rather than trying to ascend, because by descending you get the views in front of you instead of having to turn around constantly to enjoy the views. We went at a slow pace through this section since it kept opening up to views. At 5.5 miles, we reached another trail junction. The trail that branches off to the right leads to the Giant Nubble. We opted not to take this route, but from what I have read there are some great views that overlook the Washbowl and surrounding mountains. There was even a ladder to climb on the hike up. 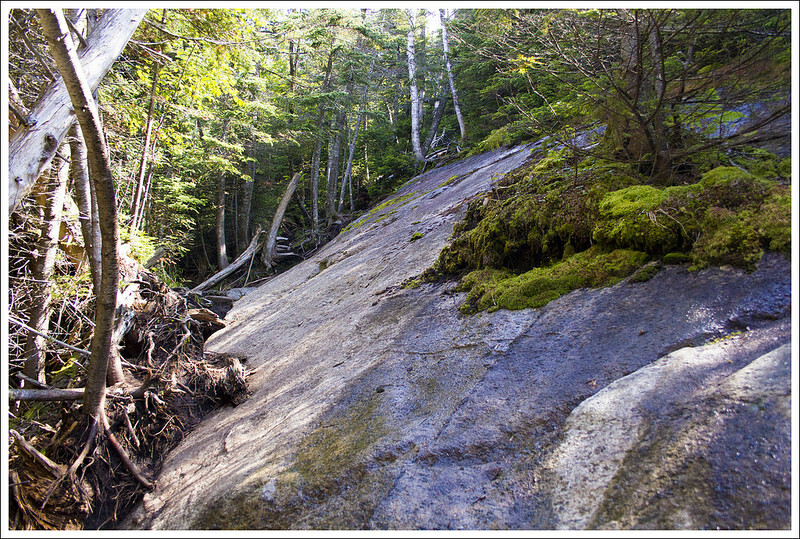 Below: Some of the climb involved clambering over big rounded rocks; Other parts were across smooth (often slippery) granite, Sometimes you had to drag yourself along the brush at the bottom of a granite slide. Continuing down the Ridge Trail, we came to the Giant Washbowl. The Washbowl is a large pond, serving as a picturesque spot begging you to reflect along the calm waterside. We crossed over a long, but low to the ground, log bridge that stretched over part of the creek. On the other side of the log bridge was another junction and trail sign. We took a right and followed this Giants Washbowl Trail that skirted the edge of the Washbowl. 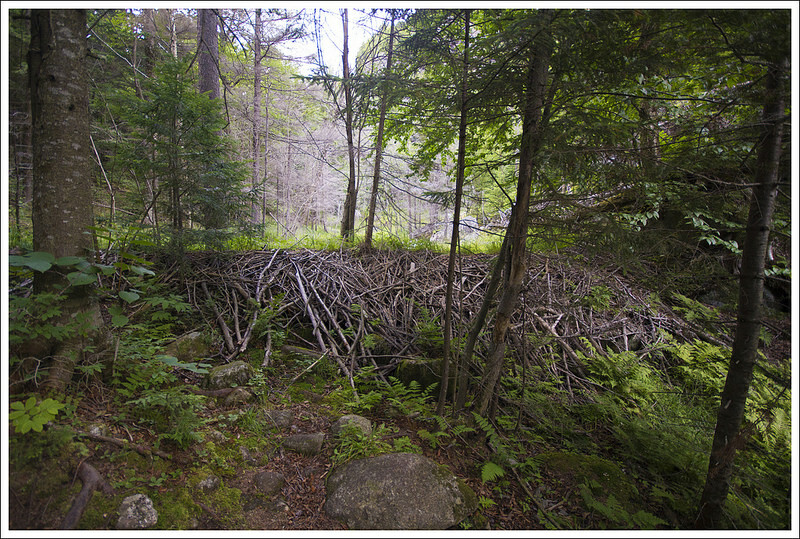 On the other side of the Washbowl, we saw a huge beaver dam and tree stumps marked with gnawing beaver teeth. The trail was mostly level, but did go slightly up and down at minimal climbs and descents. I found this part of the trail to be more wet and slick with some rocks and almost had a bad fall, but was saved by my trekking poles. 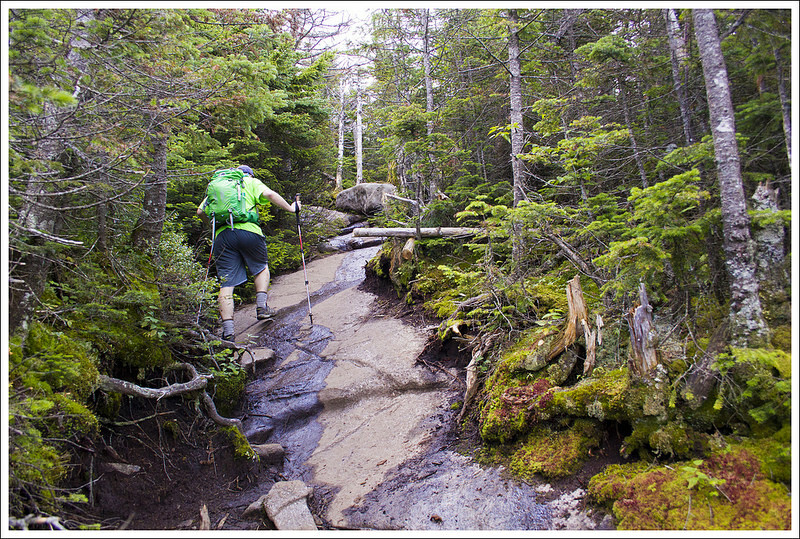 At 6.3 miles, this section of the trail rejoined the opposite side of the Nubble Trail. We kept straight on the trail and at 6.7 miles, we reached the junction with the Roaring Brook Trail. We took a left here at this junction and followed the trail back to our car, which should bring you back around the 8 mile mark. This hike was intimidating and a bit of a challenge. I remember we had read this was a great family hike. We were thinking they would never describe this as a family hike in Virginia, but I guess New York Adirondack hikers are a stronger breed than we are used to in Virginia. We found that to be the case for most of the people we met up here. 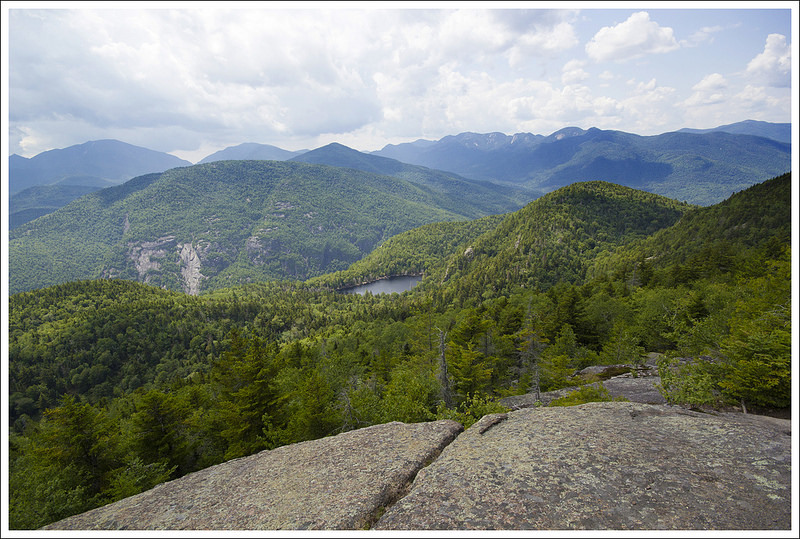 People in the Adirondacks look healthier, seem to be in better shape, and have a close connection to the outdoors. 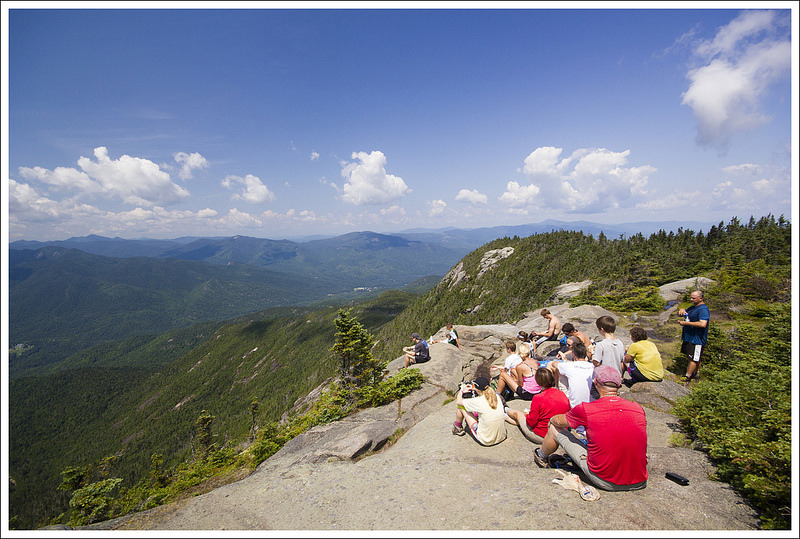 If you enjoy a bit of a challenge, the views are definitely worth it on this hike. Pictures can’t do the views justice. 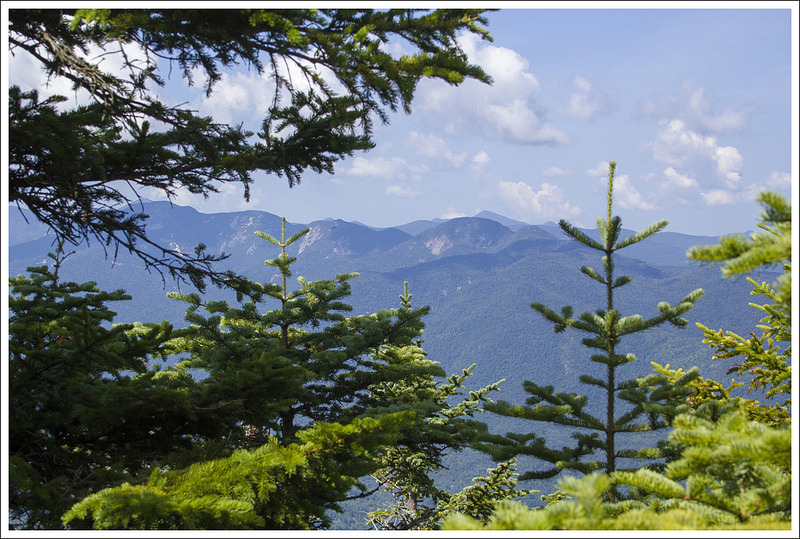 Be sure to add this one to your agenda if you are looking for a great hike in the High Peaks area. Adam did a great job doing all our pre-trip hike research for our Adirondacks vacation! Over the course of the week, we hiked a mix of big mountains and small mountains. We saw quiet ponds and cascading waterfalls. Some days were easy strolls and other days were grueling climbs. The hike of Giant Mountain was not our longest hike of the week, but I think it was definitely our toughest. It had a monster elevation gain and I found the terrain physically challenging and a bit frightening in spots. The climb started off through lovely, shady forest. The trail was cris-crossed with roots, but the footing was generally soft dirt. The climb was steady and relatively steep. As we climbed higher, the dirt trail gave way to increasing rocks. At first, it was jumbles of boulders and cobbles. We made our way, stepping carefully from stone to stone – making sure each was level and anchored before committing our full weight to the step. Eventually, we started seeing fewer round boulders, and started seeing mostly smooth, slanted granite faces. The granite was wet from storms the night before. It was also covered with a coating of incredibly slick granite sand. The climbing was very mentally challenging for me. I get really nervous when I have to cover slippery terrain that lacks anything to grab onto in case of a slip or slide. My vertigo makes me more prone to the sensation of losing my footing. There were several spots on the climb of Giant that paralyzed me with panic and fear. On one especially smooth, steep pass; I actually burst into tears because I was so certain I was going to fall off the mountain and die. I gripped the tiny hand and foot holds, took deep breath, focused on the rock face in front of me, and climbed. It sounds silly, but confronting and prevailing over fear like that makes me feel proud. Of course, just when I’m feeling my proudest – some wiry, lean 22-year old guy trots up the same rock face with the agility of a mountain goat. 🙂 I just remind myself that my vertigo is an extra challenge and I still did it!!! Super views from the summit of Giant Mountain. Below: We had fantastic views on the hike down the Ridge Trail; Sometimes the trail disappeared; Our first view of the Giants Washbowl. Before reaching the summit, we crossed a nice saddle between knobs. 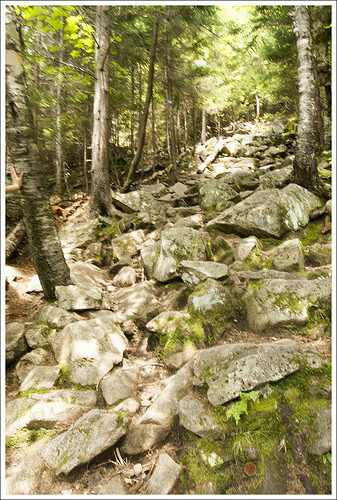 The trail was fairly level and soft and it was a great reprieve before one final scary rock scale to the summit. It took me a few minutes of deep breathing and positive thinking to climb the one last steep spot to the summit. And the summit was MAGNIFICENT! Of course, some of the beauty was stolen from me because I was already thinking ‘How the heck am I going to get down from here?’ I need to remember to stay in the moment and wish I had taken more time just to enjoy being at the top of Giant. We chatted with other hikers at the top. We took photos. And then it was time to climb down! As luck would have it, the descent turned out to be no big deal for me. I took my time, scooted on my rear end, and used my trekking poles and tree branches to brace myself. One of the hikers we chatted with at the summit took a hard fall on slick rocks climbing down. It looked like he hit his head, so I shouted to him to stay put and not try to get back up. I started climbing back up toward him to make sure he was OK. Fortunately, he was fine – just bruised and stunned. It’s so easy for one misstep to become a serious injury on terrain like this. In fact, there is a website that lists search and rescue missions for the Adirondacks. Typically, crews go on anywhere from 5-15 missions a week to help injured, sick, and lost hikers. The descent on the ridge trail offered great views. It was like a theater with the mountains up on stage. Below: Some steep descents along the granite; So much granite; Really… there was a lot of granite. 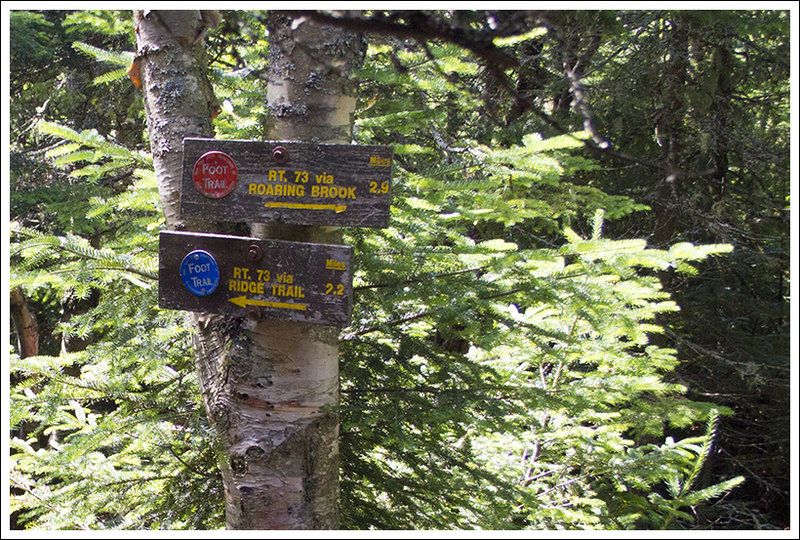 At the junction of the Roaring Brook and Ridge Trail, we stopped to review our map. We started chatting with another couple we had met on the summit. They didn’t have a map or a plan, so we shared information with them. They decided to hike with us down the Ridge Trail to see the Giant Washbowl. They had an adorable Jack Russell mix dog named Judy! She was an agile and energetic hiker. The views coming down the Ridge Trail were as nice as the summit. It was like walking into a theater of mountains. There were lots of granite faces and cobbles to negotiate on the way down. 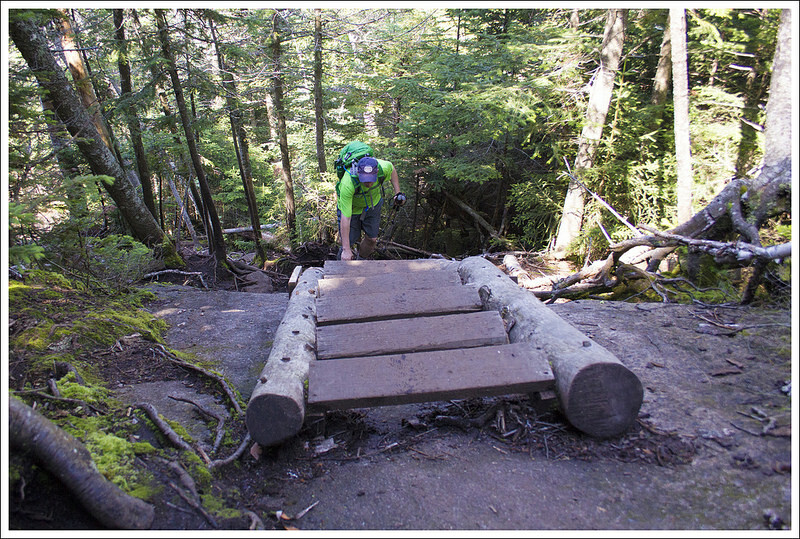 Sometimes the trail was so rugged you were left wondering if it really was the trail! We started seeing glimpses of the Washbowl from above. It was even more beautiful up close. I loved seeing the reflections of clouds and mountains in the water. From there, the rest of the hike was pretty easy and the terrain was much more moderate. We passed (and greatly angered) a couple red squirrels. They’re pretty cute when they’re mad – chattering at you from tree branches. 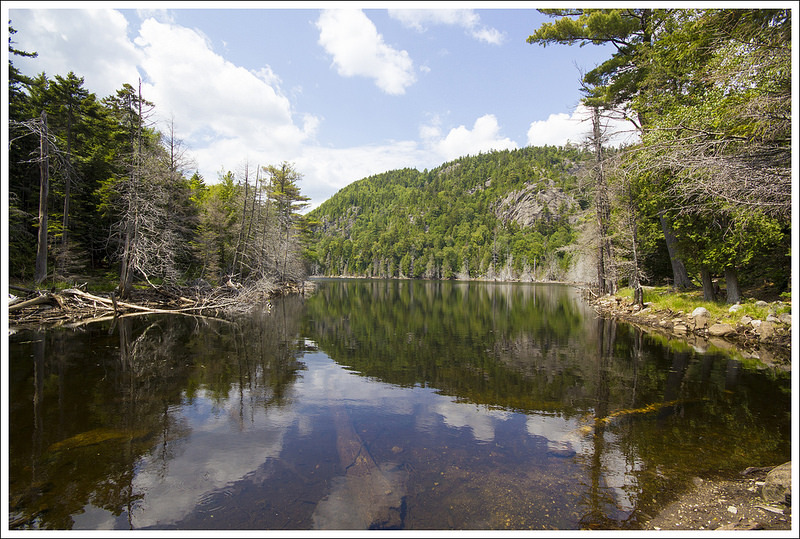 The Giants Washbowl is a beautiful mountain pond. 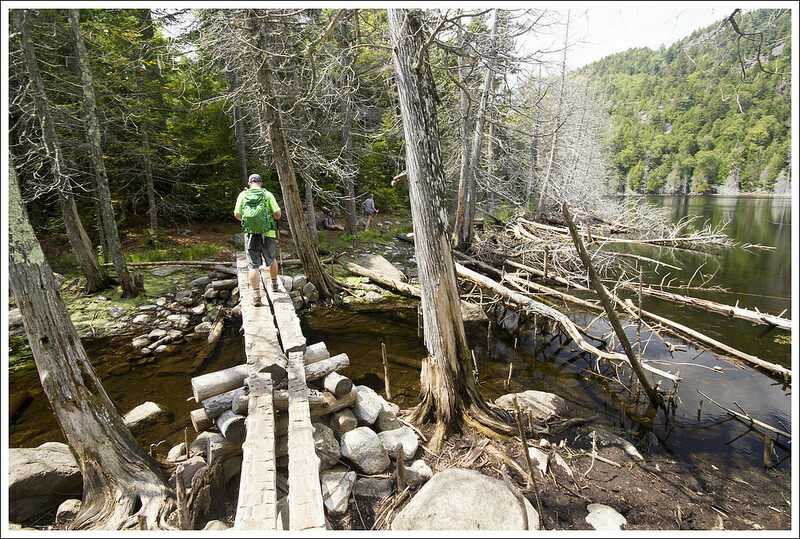 Below: Seriously, these rocks are the trail; A bridge over the end of the pond; A dam at the top of the pond. When we were almost back to the car, we passed a large family group. There were two women and about ten kids under the age of ten – all dressed in swimsuits and sandals. They were considering walking to the top of the waterfall and asked what the terrain was like. Fortunately, we were able to dissuade them from hiking the steeper rockier terrain by telling them that there was nothing really to see – which was true. The top of the falls was really low and unimpressive. We reached our car and decided ice cream was in order! We definitely earned a treat after a hike like that! Elevation Change – 3408 ft. Difficulty – 5. The hiking up here is tough. 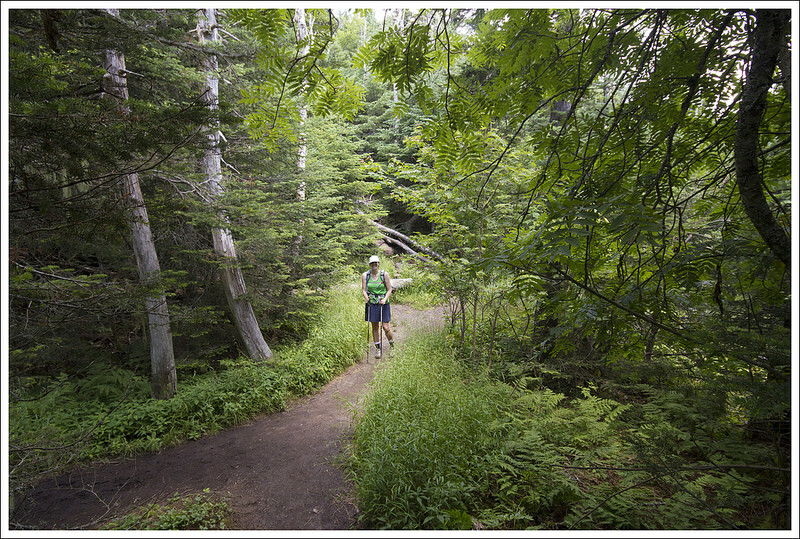 Trail Conditions – 2. 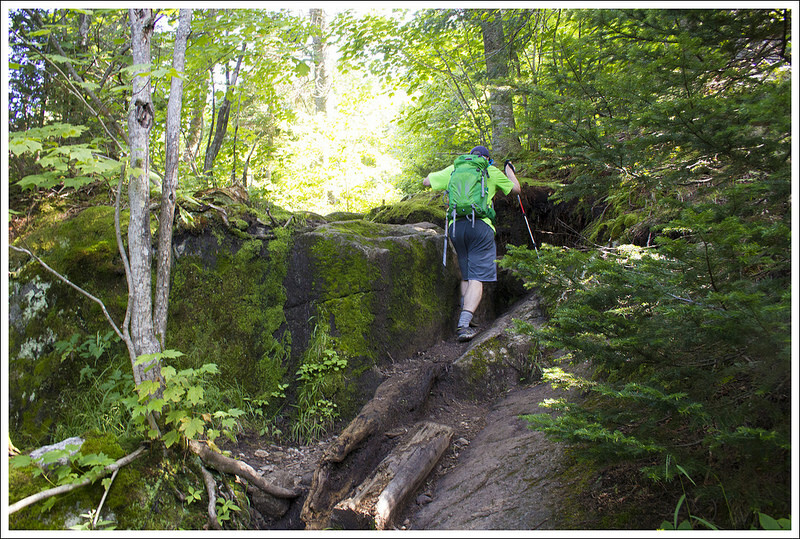 While the trail is well-maintained, there are a lot of rocks that make for very tricky footing. There is also a few sections that require you to go up slick granite rocks that can be especially dangerous after recent rainstorms. Views – 5. Outstanding panoramic views. Great views of many other high peaks in the area. 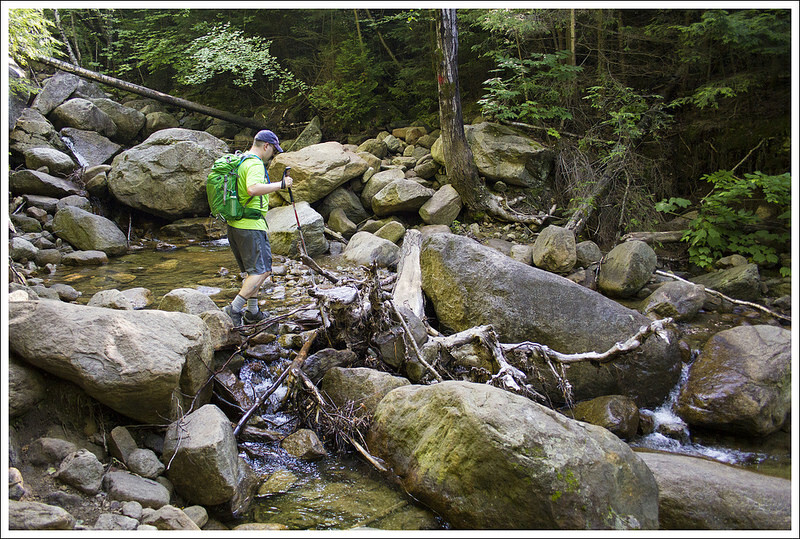 Streams/Waterfalls – 2.5 The first mile of the trail gives you some occasional views of Roaring Brook. A small side trail leads to the top of the Roaring Brook Falls. The Giant Washbowl is also impressive to see. Wildlife – 2. This is a popular trail so I wouldn’t expect to see much more than birds. Ease to Navigate – 4. Signs gave good information at the junctions. 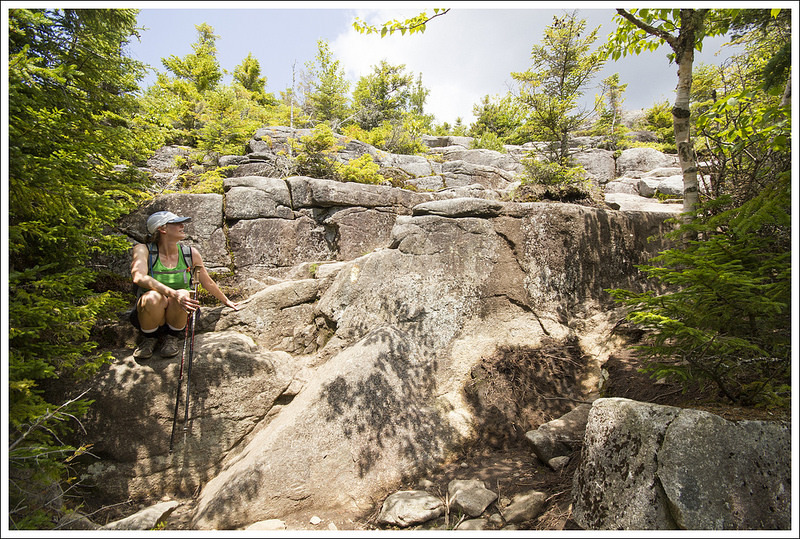 There are different options to include trips to Giant Nubble and also to connect to Hopkins Moutain and Owl Head Lookout from the summit. Solitude – 2. Expect to see plenty of people on a nice day at the summit. The summit has a lot of space to spread out and enjoy your own view. Directions to trailhead: From Keene, NY head southeast on NY-73E/NY-9 S. Continue on NY-73E for about 6.1 miles. There is a small parking lot on the left, which is shortly after you pass through St. Huberts. The trailhead is at the end of the lot. Coordinates for trailhead parking are 44.1502704,-73.7676257. Wow, look at you two, on the road for all these hikes! That’s great! Giant Mountain looks like a classic northeastern hike. Good job conquering your fears. I just got back from a week of hiking in Oregon, and took two spills. Neither was serious, just deep scrapes, but a reminder of how quickly a fun day can head south. Oregon looks beautiful! We’d love to visit there sometime. I’m glad to hear your falls weren’t serious! Cool! I missed the Flume Knob post. Even though I’ve hiked up Whiteface via Marble Mountain and Esther, I wasn’t really aware of Flume Knob. Looks like another great hike to add to my completely out of hand Northeast wishlist! BTW, if you ever get the chance to go back and can set up a shuttle, I highly recommend the traverse of Rocky Peak Ridge to Giant from the east, then descend to Route 73, or vice-versa to avoid as steep a descent. Great article, but I especially love the part above. The same could be said of most of the Northeast, including the Catskills, Greens, Whites, and Maine, which is why I love it so much up there – even though I have lived in Virginia for all of my 50 years. Their mountains are not particularly big, and average elevations are lower than the Southern Appalachians, but they are steep, rugged, and challenging with far more views and worse weather. 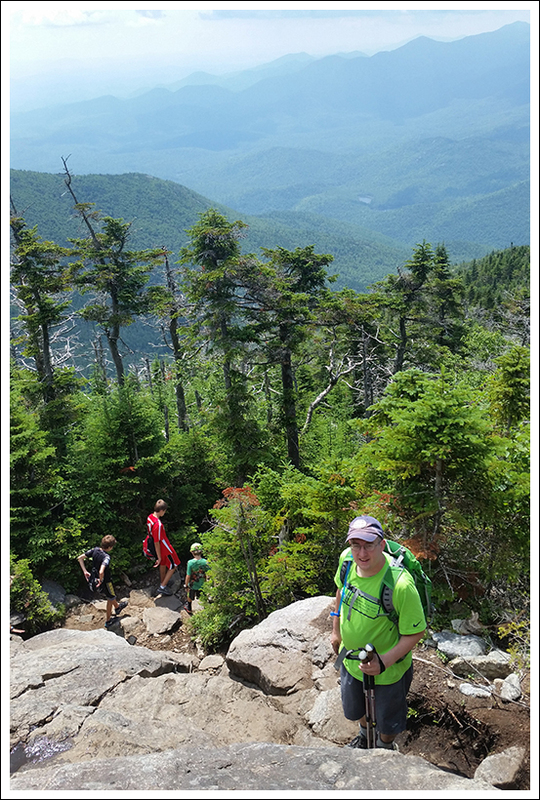 I was fortunate enough to finish the 46ers two years ago and hope to finish the Northeast 115 with two peaks in New Hampshire next month. Starting the trip out with a number of firetower peaks and others in the Dacks though. What else did you two hike up there? I look forward to the posts! Thanks for the visit, Rick! Giant and Marcy were our two big hikes. We also hiked Mount Jo, Rocky Falls, and part of Van Hoevenberg (before a storm made us turn back). And, of course… Flume Knob which is already posted. After we finished our week in NY, we spent 10 more days in New Hampshire. We love hiking up north!